Situated in the heart of the Divina Amalfi Coast, Praiano is the optimal for people does wont spend a quiet and not so expensive holiday, but in same time be very close to the much more famous and busy Positano! 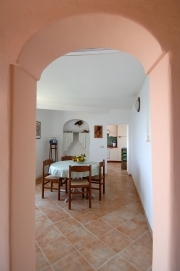 Casa GIANPI is a beautiful apartment situated in the pretty, tranquil village of Praiano located in the centre of the magnificent Amalfi Coast. Mediterranean in style, the apartment sits in the most scenic and picturesque area of the village and is easily accessed via a short path (100 metres) from the main street. The apartment is typical in style of the local architecture and is tastefully and elegantly furnished. It has a wonderful private garden from where you can enjoy the magnificent view. The privacy and seclusion of the garden makes it ideal for sunbathing and relaxing. The garden is also equipped with a barbeque and dining area, perfectly suited for eating in traditional Italian style - al fresco, by day or night. The apartment is conveniently located close to a variety of local shops (100mts). The local grocery shop, which offers a delivery service, provides a wide variety of local fresh produce, ideal for lovers of cooking. For lovers of hill walking, one of the most famous pathways of the area, 'The Sentiero degli Dei', is accessed directly from the apartment and the town itself is also ideal for walking, containing a myriad of pretty paths, lanes and alleyways - a wonderful way to explore this colourful little town. The local bus stop is also conveniently placed close to the apartment. The bus service can take you through the village and on to the pretty pebble beach of Praia (500mts.). This pretty local beach is a 'must see' on your holiday, equally beautiful by day or night, and is surrounded by an assortment of excellent restaurants offering a wide choice of locally produced traditional cuisine, in particular freshly caught fish. The beach is also accessible on foot via a path through the town and a series of steps. From the beach you can also easily hire small boats and further explore the magnificent coastline. The larger and busier town of Positano (also with a beach) is just 6 km away, and we would recommend using the frequent public transport to avoid parking on arrival .The public transport system (bus/taxi) is also a convenient way to visit the more famous towns along the coast such as Sorrento, Amalfi, Capri, Salerno, Pompeii, Positano, Ravello and the city of Naples. From Praiano it is also possible and easy to organise boat trips to the towns of Amalfi and Sorrento. The apartment has a raised ground floor containing a bright dining room and modern fitted kitchen. On the first floor you will find a large comfortable living room complete with cosy fireplace and access to a balcony affording a spectacular view of the sparkling ocean and magnificent coastline, beautiful by day, and stunning by night. The bedroom is en suite with shower, and has a balcony with a wonderful sea view. Casa GIANPI is an elegantly decorated apartment with a beautiful private garden, striking views and all the facilities you need to enjoy your holiday.It has the advantage of being ideally placed for privacy while at the same time its location allows convenient access to all of the town's amenities as well as providing easy access to all of the famous towns and sites along the Amalfi Coast. Access to the apartment is via a short footpath (approx. 100 metres. )from the main street. Raised Ground Floor: dining room and fitted kitchen. First Floor: large living room with fireplace and access to a balcony with sea view, 1 double bedroom with en suite (shower) and balcony with sea view, 1 double bedroom (without windows) with wc/hand basin. Private garden with spectacular sea view, equipped with barbeque, dining area and sun chairs. The apartment is equipped with washing machine, microwave, TV and stereo.One set of bed and bath linen per week included in the price. From Rome reach the main road "A1"direction south (Napoli) and, after leaving Napoli, take the main road "A3" to Napoli - Salerno (Not Tangenziale Napoli). At Castellammare di Stabia, take the road to Sorrento. Anyway everywhere (along the motorway too) there are brown signs "Penisola Sorrentina": follow that sign. When You arrive to Piano di Sorrento (a village along the way) takes Via Cavone and follow the National Road 163 to Praiano. A shuttle links the Airport with the main railway station in Rome. From Rome several trains go to Naples (The trip takes approximately 2 hours). In alternative, (only during working days) from the Tiburtina train station You can take the bus of “Marozzi” company that leaves from the capital at 7:00 am and 3:00 pm: the bus takes directly to Sorrento ( Euros 15.99). In Sorrento You can board the buses operated by the "Sita" company that takes to Praiano(60' min). From Naples Capodichino You should follow the motorway A/3 Naples-Salerno as far as the exit Castellammare di Stabia; once You are in Castellammare You follow the National Road 145 (SS 145) as far as Sorrento which is about 48 kms away from Naples. Anyway everywhere (along the motorway too) there are brown signs "Penisola Sorrentina": follow that sign. When You arrive to Piano di Sorrento (a village along the way) takes Via Cavone and follow the National Road 163 to Praiano. From Naples airport You can take a taxi or bus to the railway station at Piazza Garibaldi. At the main train station Piazza Garibaldi in Naples You will be able to board the local Circumvesuviana trains which leave for Sorrento every 20 minutes all day long. In alternative, from the Naples Capodichino Airport You can take the bus of “Curreri” company that takes directly to Sorrento with departure at 9:00 am – 11:30 am – 01:00 pm – 02:30 pm – 04:30 pm – 07:00 pm. (The trip takes approximately 1 hour). Once in Sorrento You can board the buses operated by the "Sita" company that takes to Praiano (60' min).